GUEYEDE, Côte d’Ivoire, Aug 16 2014 (IPS) - The whole village of Gueyede in south-west Côte d’Ivoire gathers under the tattered roof of a shelter as the rain drizzles outside, and listens carefully as sub-prefect Kouassi Koffi talks. “We are not allowed any complacency. 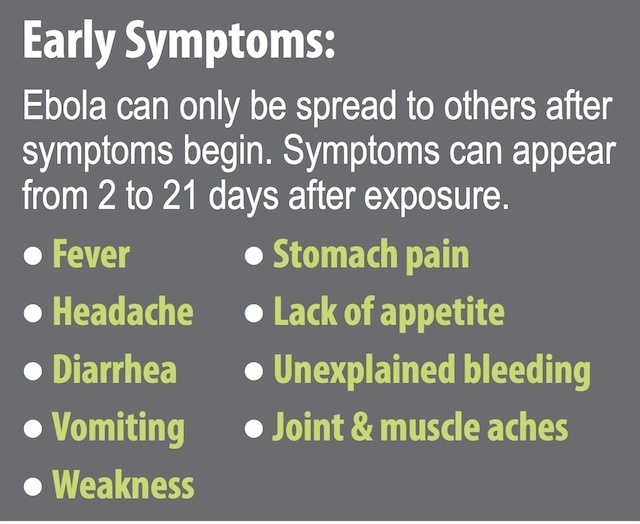 You might not know Ebola. And it is better that you don’t,” says Koffi, the highest governmental authority of the area, through translator Serge Tian. Koffi explains how one can contract the virus and how to recognise the basic symptoms of Ebola hemorrhagic fever. He has held hundreds of meetings like this since the first Guinean cases of Ebola appeared last March. He travels from village to village in the Tiobli region he is in charge of, often visiting the same village two, three or four times, to utter the same message. After the stop at Gueyede, IPS will follow him in another village, to answer the same questions from locals with well-prepared lists. “It is a lot of work. But I think the population gets the message as we discuss [Ebola],” Koffi tells IPS as he drives his SUV on a particularly bad road. His peer sub-prefects and prefects hold the same meetings in other Ivorian regions. This West African nation has had no cases of Ebola yet. But the Liberia border is few kilometres away. 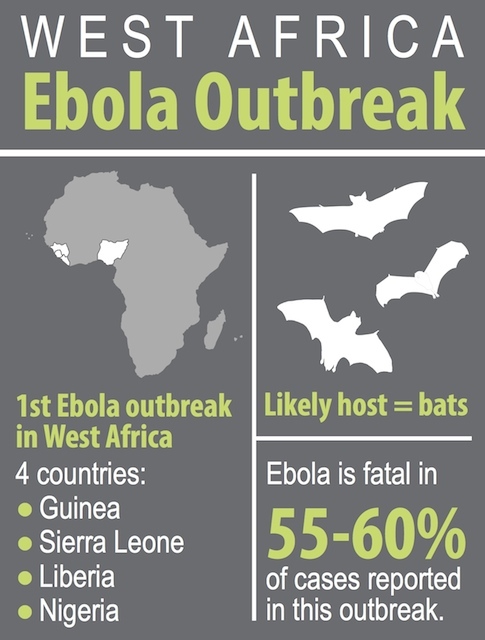 And the epicentre of the current Ebola outbreak is not more than 100 kilometres in Sierra Leone, Liberia and Guinea. “We should not wait to have a first case of the illness to take measures. Public mobilisation is important as the state cannot be everywhere,” said the Health Minister Raymonde Goudou Coffie during her last press conference on Thursday, Aug. 14. Two of out of the four countries hit by the current epidemic, now declared out of control by the World Health Organisation (WHO), share a border with Côte d’Ivoire. Nigeria is the fourth country in West Africa that has had cases of Ebola. And many worry that Côte d’Ivoire will soon be the next country to be hit by the most severe outbreak of the illness since its discovery in 1976. So far, there have been more than 1,000 deaths and the number of infected people is expected to soon hit 2,000. However, WHO said Friday, Aug. 15 that those numbers were “vastly underestimated”. When the first cases appeared in Guinea last March, the Ivorian government took several preventive measures, including the creation of advanced detection centres, and a strict ban on bush meat — which is believed to be a vector of contamination for the Ebola virus. For the inhabitants of Gueyede, it is a big deal to not eat bush meat. Most of their protein comes from it. They especially fancy grass-cutter, a big rodent. Giving up this popular delicacy has meant that Ivorians had to change their habits. But they did. And government has closed all bush meat markets in the area. Nevertheless, locals still have to figure out what to eat and what not to eat. “We can eat fish. But we can’t eat bush meat. So can we eat crocodile?” asks Gueyede chief Bernard Gole Koehiwon. Puzzled, the under-prefect redirects the question to the area nurse, Drissa Soro. “I’m not sure. But I think it is safe. I will check and come back to be sure,” Soro says. Diet is not the sole concern, and is not enough to fight the spread of a disease that kills almost 90 percent of infected persons and which spreads mostly through body fluids. At public meetings villagers learn what to do if someone seems to have the illness. But they mostly share their thoughts, try to figure out how the disease spreads, and to sift out the facts amid the rumours about the virus that spread very fast. 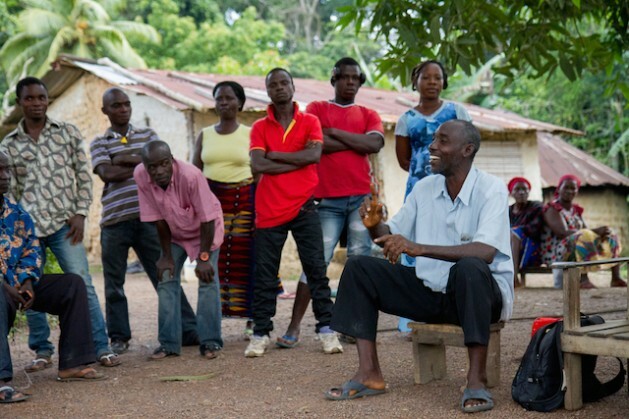 The sub-prefect has a difficult task explaining why it is dangerous to shelter a member of their family from Liberia. In Côte d’Ivoire, the ethnic groups here are split along the Liberia’s borders with families having members living in both countries. In addition, 50,000 Ivorians are still sheltered in refuge camps in Liberia since the 2010-2011 electoral crisis here. One lady at the meeting, who came back from Liberia few weeks ago, worries about who will take care of her old parents that she left in the refugee camp. She travelled home ahead of them to prepare the house for their return. The sub-prefect says that they are taken care of, but it is difficult to find the words to reassure her. Changing diet and avoiding family members are difficult changes. But Ivorian authorities are betting that it is possible through peer education. Once the under-prefect leaves, community leaders push the message. In each village, a coordination committee incorporating several members from all ages and genders is created to pursue the discussion. “Those villages are very isolated. Some of them are not accessible by car,” explains sub-prefect Koffi. It would not be possible to contain an eventual pandemic without community support. Nurse Soro agrees. “I am on alert since last March. Every time I see someone, I talk to him about Ebola. I try to see if there could be possible cases,” he tells IPS. As there are no doctors in the area, Soro is the most qualified medical source for about 6,000 inhabitants. Even if he drives from village to village in his little motorcycle on muddy tracks, he does not have the time to see everyone. Albertine Beh Kbenon is part of the coordination committee in Gueyede. “At first, we thought Ebola was a joke — a rumour invented,” she tells IPS. She is now taking the threat seriously enough to go from door to door and to talk about it. She was herself first very sceptical of what authorities were saying. When the local and international media, especially radio, relayed the information, she realised that it was serious. “In Liberia they took this as a joke. They believed the government was lying. This killed them. We don’t want this to happen here,” concludes Kbenon. If Nigeria is included among the countries that are affected by the Ebola virus, I wonder why the USA and Spain are not. They are all three in the same situation. They recorded cases of people infected in the same manner, ie because they were in one of the other countries in the region where the emergency was declared.